Having an understanding of different core beliefs is essential to students fully appreciating how religions approach ethical dilemmas and function within society. That’s why, for each of the six largest world religions, we’ve hand-picked two introductory resources to help you provide learners with knowledge of origin, cultural differences and ideology. What are you waiting for? Brief intro to Buddhism, again pretty self explanatory. I was trialling a new thing where objectives are displayed at all times - haven't kept with it to be honest but it&'s an idea - maybe you can adapt it and make it a bit better! Stand alone resource which asks students to express their own opinions on aspects of Christian beliefs and practices. Suitable for both long and short course RS syllabus and could work as a homework booklet. Lesson on Creation for the new AQA GCSE RE Spec A. Please rate and comment any suggestions / feedback. An introduction lesson based on Hindu philosophical concepts and making links between them. Focus on Brahman, Samsara, Atman, Moksha, Dharma and Karma. Worksheet for pupils to complete. Self explanatory lesson about an introduction to the study of Hinduism. Complete with activities, powerpoint, lesson objectives and photo analysis visual material. Ideal for KS3 pupils. This lesson examines the six beliefs of Islam. It is intended to serve as the first lesson of the 'beliefs' part of the second area of study in Edexcel GCSE Religious Studies B. Check this account for more resources in this scheme of work. Please review this product if you found it useful. This lesson introduces Judaism to year 9 students. The lesson addresses the basics of the faith and the differences between the different kinds of Judaism. 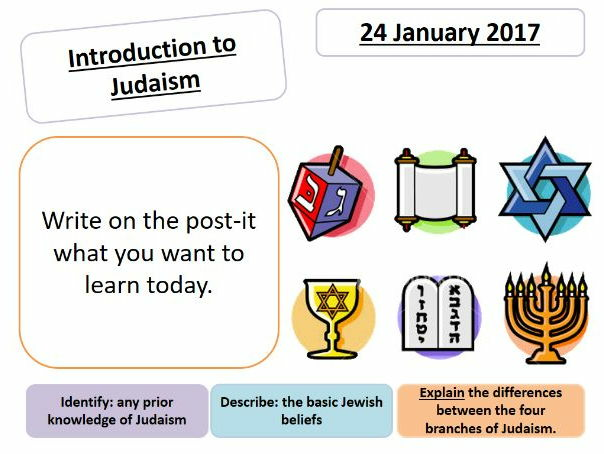 - A3 poster sheets for students to teach each other the different elements of Judaism. - star of David sheets for plenary.